Matt acrylic water-based colors, especially formulated for airbrushing. Each color has been meticulously developed in collaboration with model painters who are specialists in fantasy figures and dioramas. Most of the colors in Game Air have their equivalents in Game Color, so that the modeler can combine both formulations and work simultaneously with a brush or an airbrush. Game Air can be used directly or diluted with Vallejo Airbrush Thinner and Flow Improver. It is recommended to apply the colors in several layers on a previously primed surface. The colors preserves all the smallest detail of the model, they dry very quickly and after a few hours form a homogenous film of extraordinary resistance. Game Air performs exceptionally well on all surfaces; the adherence of the colors on resin, plastic, steel and white metal is extraordinary. Compressor adjustment for these colors is recommended at 15 – 20 PSI or 0.5 a 1 kg. For best airbrush maintenance we recommend using the Vallejo Airbrush Cleaner. Safety: Game Air is not flammable, and does not contain solvents. Please see also certified safety information of the product on the Safety page. 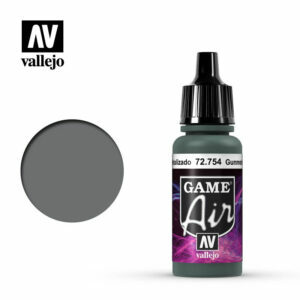 Packaging: Game Air is presented in bottles of 17 ml./0.57 fl.oz. with eyedropper. This packaging prevents the paint from evaporating and drying in the container, so that It can be used in minimal quantities and preserved for a long time.